Discover the winter beauty of Jacques-Cartier National Park on this roughly 4-hour ski-shoeing hike. A mix of cross-country skiing and snowshoeing, ski-shoeing provides low-impact exercise amid peaceful forest landscapes. 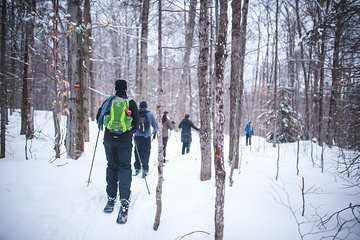 With trekking poles in hand, follow a guide onto snowy trails and learn about the Quebec woods. Warm up with hot chocolate, stop for lunch, and keep watch for wildlife in the area, including deer and moose. This small-group tour is limited to eight people, ensuring a more personalized experience. Excellent tour in a very scenic and beautiful forest. We had a wonderful time walking thru this snow white landscape. The terrain was fairly level but did had some slight slopes. Very quite and peaceful adventure. The Best! Vicky was a great tour guide that provided everything to make our excursion a fun time. She was organized with picking up the food for our free lunch, made homemade hot chocolate for us in the middle of the excursion and helped us every step, slip, climb and fall without missing a beat. She is the best! This tour was amazing but harder than we imagined. Our tour guide was very patient and very polite. I would recommend this tour to anyone that wants a good cardio work out and enjoys the outdoors. Wow wow what a great experience. Johann pick d us up at our hotel as on time and drove about half an hour to the mountain location. He gave us brief instructions on how to put on the skis. We had experience skiing previously and chose this as it was not the full down hill type of skying. We had loads of fun going through the virgin snow traversing around steps that werent completely covered yet. Johann was very professional helpful and considerate helping with buckles and straps and tc when needed. A great experience but not all that easy when the downhill not too many bits came around. He also took photos and video along the way which we have just received. Thanks Johann.